Individual examination; no time limit. SCID-I is a semi-structured interview conducted to diagnose Axis I disorders according to DSM-IV. The interview modules deal with: affective disorders, psychotic disorders, substance-related disorders, anxiety and somatophormic disorders, eating disorders and adaptation disorders. The SCID interview can usually be conducted during one session of 60 or 90 minutes, duration depending on how comprehensive is a patient's history of his/her psychiatric treatment and on his/her ability to describe concisely his/her psychopatological symptoms. After SCID-I has been conducted, usually SCID-II is used (sometimes next day). The SCID interview was designed to meet the requirements of both researchers and clinical practitioners. This means that the instrument should be detailed enough to satisfy scholars, but also convenient enough to be used in clinical practice. 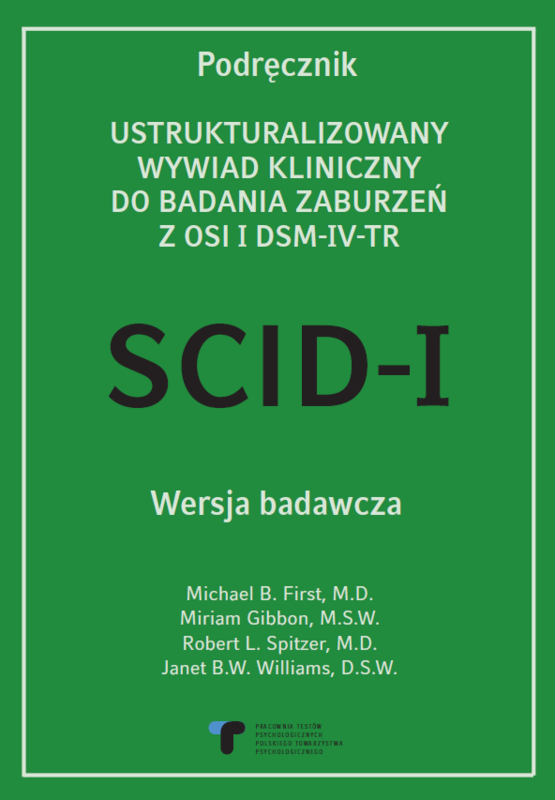 The Polish translation is a detailed research version which allows for modular examination (the interview directed at particular selected disorders). The SCID interview does not require computer program in order to make a final DSM-IV diagnosis. However, to make computer statistical analysis and data comparison easier, numbers referring to data fields were inserted in both the score chart and in the SCID modules.